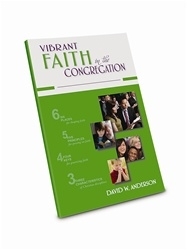 Whether just getting started or looking for best practices, David W. Anderson’s book, Vibrant Faith in the Congregation, addresses the important task for the church to be missional, that is, to help people live out the gospel in word and deed in homes, congregation, community, and the larger world. 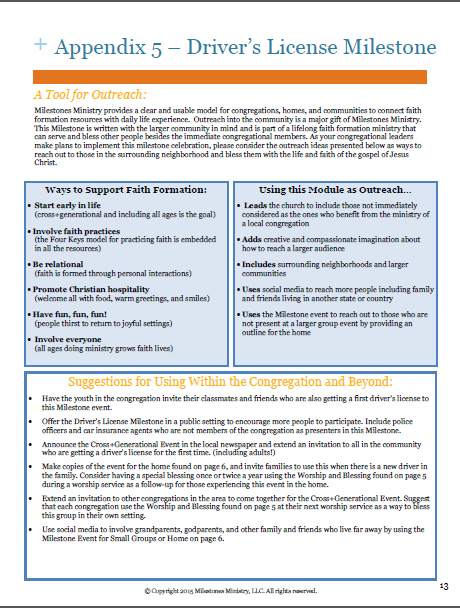 The Vibrant Faith Frame is explained from the perspective of various congregational ministries, including evangelism, Christian education, worship and preaching, youth and family, and stewardship. The book helps connect all of a congregation’s programs into one ministry, rather than having several disconnected activities under one roof. As a result, congregations stay focused on two foundational tasks in everything they do – Christian faith formation and community outreach. Milestones Ministry fosters a vital partnership between home, congregation and the community. Milestones Ministry offers congregations the “common ground” they need to reach out into the community and forge a connection with others because everyone, whether a church member or not, experiences the life events that milestones celebrate. Historically, Sunday school was established as a way to reach unchurched children in urban areas. Although Sunday school can still play an important role in congregations, families’ busy schedules and sporadic church attendance sometimes hinder its effectiveness. That’s where Milestones Ministry steps in. Used in partnership with Sunday school or other similar congregational programs, Milestones Ministry can help strengthen the church’s role in the community through simple, yet memorable, celebrations of important life events. Milestones Ministry reaches out to people in ways that provides a fresh relationship between church and society. Milestones Ministry reignites relationships between church and the larger society by connecting with people at moments that touch their lives deeply, times of births and deaths, times of beginnings and endings, times of personal and community development at school, work, and a host of other personal and family experiences. Milestones Ministry events connect with people’s life experiences and stories, including their transitional moments in life that deserve attention and have imbedded in them the desire to find meaning. Milestones Ministry effectively identifies and addresses developmental and transitional moments like a child’s first day in school, learning a skill like driving a car, graduations, moving, developing a career path, loss of a job, retirement, and a host of other milestone moments. Milestones Ministry provides a very natural setting to explore a deeper relationship with God and the church. Milestones Ministry reaches out to the surrounding communities in ways that do not force people to make long-term commitments, but do make a difference in people’s lives—a difference that will lead people to want more from the church. Milestones Ministry can become a pre-confirmation program to help prepare youth and families for a more in-depth exploration of the Christian faith during adolescence and in the life of the home. For older youth and adults, Milestones Ministry continues to equip people as lifelong disciples. Faith is formed by the power of the Holy Spirit through personal, trusted relationships – often in our own homes. The church is a living partnership between the ministry of the congregation and ministry of the home. Where Christ is present in faith, the home is church too. If we want Christian children and youth, we need Christian adults.